WHEW its been quite a little vacation week. By the time you read this I will have been in 4 different states by 10:30 am. 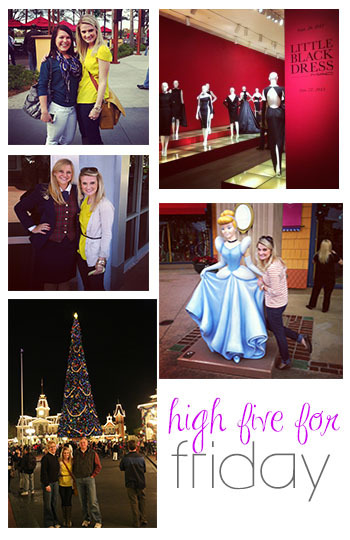 Well on to my favorite little link up High Five for Friday with the snow bunny Lauren @ From My Grey Desk! 1. I MET MY BLOGGER BFF Jess. Yall, it was the best/weirdest thing ever. We met it seriously felt like we had known each other for YEARS. SO MUCH FUN. 2. The blogger meet up fun continued with sweet Kathleen! She works at Disney and seriously saved our trip with her Disney magic! I am so lucky to have such sweet blog friends!! 3. I just really loved spending time with my family! Sometimes its hard living so far away from them, but sweet trips like this make it better! 4. YALL I WENT TO THE COOLEST MUSEUM EVER. I cant wait to share with you all the details of the Andre Leon Tally Little Black Dress Collection, seriously yall are going to DIE. 5. A trip to Disney isn't complete with out a cameo from Cinderella. PS. You are the sweetest! Woohooo. I can't wait to visit disney again. Looks like you had an awesome vacation! What a fun vacation week! And TWO blogger friends?! What?! And at the same place? It's true that we bloggers really do become so well connected. Crazy! Standing next to each other...in real life. Not a big deal...:) EXCEPT IT IS. So glad y'all had fun at Disney! And hello I can't wait to hear about that museum! I may be slightly jealous that you got to meet Jess irl!! 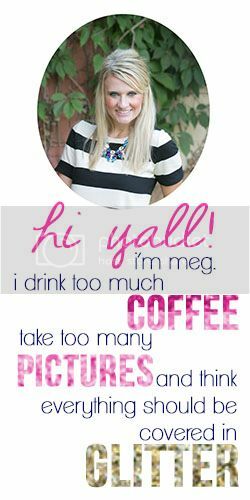 I need to meet some blogger friends!